On Wednesday five (extra) boys arrived toting their computers. They plugged into a 16 portal hub, networked up and played away. For the past two days and all night long our study has been cramped full of eight boys (and two resident girls) gaming away. Their idea of Paradise. Looks like a great indoor holiday activity. I have some very lethargic boys today! My kids would love love love this one!! Ok Thank you so much for posting this. My son LOVES to host LAN parties here and I thought oh boy. But they thrive on it so much 🙂 He will be 18 this weekend and party will be a LAN party in the evening!!! 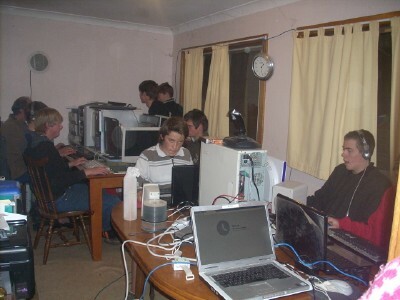 Great to hear of other LAN parties!